When it comes to Oxford’s original writer-in-residence, William Faulkner, most people can easily rattle off at least one or two of the titles that earned the man his place in the literary pantheon. Relatively few people, however, are familiar with a work titled “The Marionettes,” a one-act play written by Faulkner years before he published any of the novels his reputation would be built upon. The University of Mississippi Department of Theatre and Film aims to remedy that with a rare staged reading of the little-known play at 7:30 p.m. Monday (Oct. 22) in Meek Auditorium. The event is free and open to the public, and no tickets are required. The production is part of the Ole Miss Common Reading Experience, a program that is intended to foster a sense of community by encouraging every first-year student to read a selected text that will be woven into classes. The selection for 2018 is William Faulkner’s “Collected Stories,” which Peter Wood, professor of theatre arts, said inspired him to work a theatrical event into the CRE programming – no small feat, given the paucity of plays in Faulkner’s body of work. A staged reading, as opposed to a full production, is exactly what it sounds like: actors on a stage reading a script as if they were performing it, but without sets, props, costumes, choreography and other theatrical elements typically found in a performance. The play lends itself well to such a pared-down presentation, Wood said. “The play itself is kind of a symbolist drama, and in symbolist dramas, a lot of what’s happening is in the interior,” he said. “There’s not a lot of action … it’s more of a poetic meditation on themes of desire, sexuality, growing older, life and love. Faulkner wrote the play circa 1921, during his brief stint as an Ole Miss student, for the campus drama club, The Marionettes. 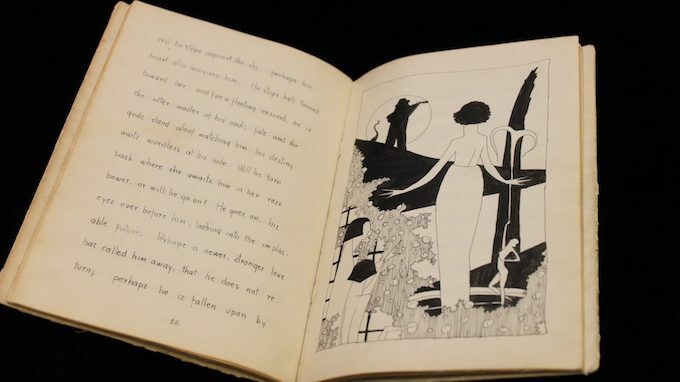 The play is entirely written, illustrated and bound by hand, and Faulkner produced only six copies, one of which is on display in the J. D Williams Library. It wasn’t until 1975 that the play was published commercially, in facsimile, by Yoknapatawpha Press. The Marionettes may have performed the play back in the 1920s – and that may be the last time it was seen by an audience. Despite its limited exposure to theatregoers, “The Marionettes” has attracted the attention of Faulkner scholars and enthusiasts specifically because it was written so early in Faulkner’s career. “Faulkner isn’t ‘Faulkner’ yet,” Watson said, “So when people get interested in this play, they mainly get interested in what it might foreshadow about where Faulkner’s going to go from here. “The Sound and the Fury,” published nearly a decade after “The Marionettes,” in 1929, employs the stream-of-consciousness style – as well as a similar narrative device called “interior monologue” – that would become a hallmark of Faulkner’s most enduring novels; the author is credited with advancing the development of these techniques in the early 20th century. The play is a basic melodramatic romance: Boy woos girl, girl relents, boy disappears. But the similarities between Marietta, the female love interest, and Estelle Oldham, Faulkner’s childhood sweetheart who eventually became his wife, have led scholars to a more personal kind of speculation about the author’s early work. “On a more biographical level, scholars have been very interested in how much Marietta derives from Estelle Oldham, who at the time that he wrote this was the childhood sweetheart that he couldn’t marry and who had gotten married to another man and was no longer living in Oxford,” Watson said. Oldham’s marriage eventually broke up, and when she returned to Oxford to live with her family, Faulkner was waiting. They were married in 1929, the year “The Sound and the Fury” was published. “These are a few of the many reasons this play has been interesting to people,” Watson said. The staged reading, which will run approximately a half-hour, will be followed by a talk-back with Watson and Wood in the auditorium and a reception in the lobby of Meek Hall. Ventress Hall is located at 1667 University Circle on the southwest side of the Grove.